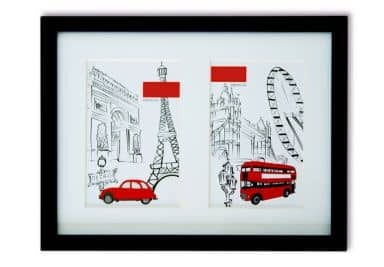 Wall stickers with real picture frames are the perfect combination! With your favourite text sticker or wall sticker you can now frame your own pictures! You choose the frames in the colour you like and for the wall sticker you also pick a colour you desire. The frames give the wall sticker a three-dimensional look. 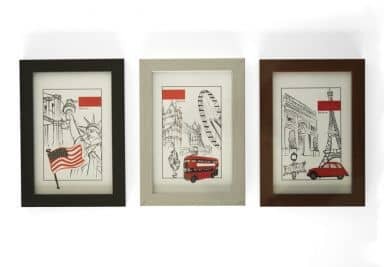 The picture frames are available in black, brown, in wood colour and in silver. If you'd like more frames for the wall sticker, you can order these extra. You can also expand your wall sticker with larger frames. It is a great wall decoration for your living room or hallway. 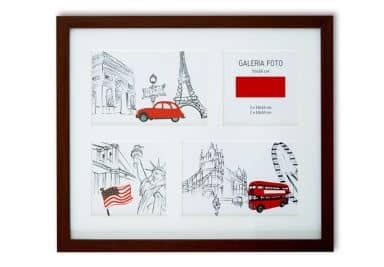 One of the most favorite wall stickers accompanied frames is the 'Wall of Love'. Instead of a so-called Wall of Fame do you create your own 'Wall of Love' with the photo frame your most precious photos from your family and loved ones. If you are looking for a wall sticker with photo frames there to take pictures of your family beautiful framing, the wall sticker 'Family is Everything' perfect. Pictures of your family, your children and your husband or wife hung on your wall in the best way if you choose the 'family tree', it seems as if your tree is painted on the wall. Only at Wall-Art, the combination of a wall sticker with photo frames. Create a wonderful hightlight in your room, using a high quality wallsticker with real wooden frames. Show what family means to you! Combine wall sticker with photo frames! Decorate with your favourite photos! Your favourite photos in beautiful blossoms. Combine wall stickers with your own photos! Combine your photos with wall stickers. Flowery combination of photos and stickers! Great combination of wall stickers and photo frames! Frames and wall stickers go together well! Combine your photos with wall stickers! Frames and wall stickers go very well together!